Phishing is just what it sounds like, but with a different spelling. A fisherman places bait on their hook and hopes that fish will come along and bite it. The bait in this analogy often takes form of an email, text message, or even a Facebook message and at times they can claim to be friends, relatives, or even the MCC Help Desk. The fish, being the individual who received the message, is often directed to click on a link or provide credentials (username and/or password). These emails are made to appear authentic and to trick the user into giving up information. With the holiday season coming up phishing emails will be on the rise appearing from legitimate companies. The best way to be able to spot a phishing email is to look for key indicators on where the email is from, what the email is asking you to do, and what incentives there are for opening the email. 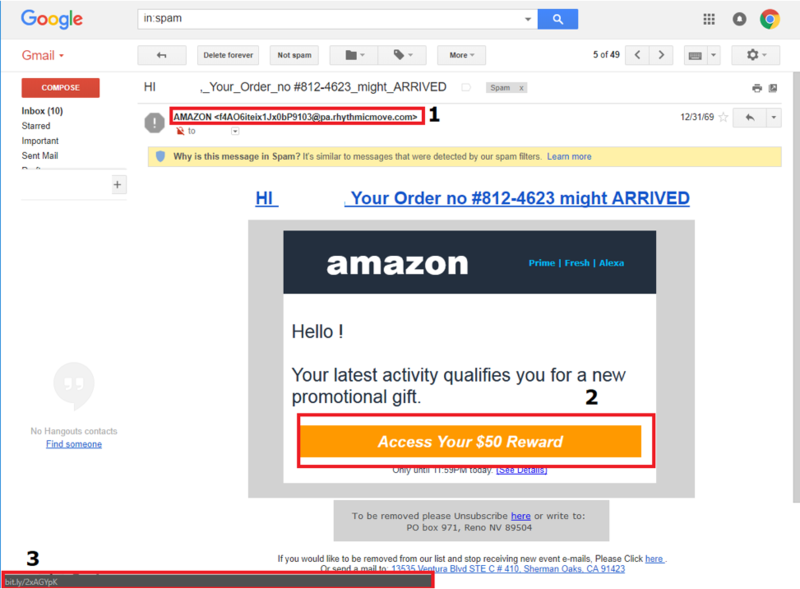 In the example below from my own email address, I have a phishing email claiming to be from Amazon about an order and an opportunity to a $50.00 reward as a promotion. Highlighted in the red boxes are indicators that alert me to this email is in fact a phishing attempt. Although the email says it is from Amazon, 1st red box, we can tell upon further inspection that it is not from Amazon. Looking at the email address of the sender and ensuring that it is from the actual website itself and not a suspicious chunk of text is the first red flag. Going onto the 2nd red box we can see that I’m entitled to a $50.00 reward for my latest activity. This however is the bait to entice me to clicking the link that will either install malicious software on my computer (malware) or direct me to a website that is designed to appear just as Amazon’s login page looks like and steal my personal information. Upon hovering over the link with the cursor we can see 3rd red box which is a URL shortener. Amazon does not use these and being aware of where links are directing the user to is important. The key part in this is identifying the web address. Some phishing emails attempt to mask the address as such: https://www.Annazon.com. Did you notice the missing M in the link? By thoroughly reading the website address you can determine if the email is legit. The main objective of a phishing campaign is to gain personal information by getting unsuspecting users to click on links or provide user credentials, credit card information, or personal information to the attacker. Phishing emails are designed to entice the user into opening them with the promise of a reward or by creating a sense of urgency such as your password needs updated, or you will not be able to access your MCC account. By being proactive in looking for indicators in all emails, social media messages, and text message you can help combat phishing and keep your personal information safe from attackers. Should you receive a phishing email mark it as spam and do not follow the instructions or simply just delete it. One important note to remember is that the MCC Help Desk will never ask for credentials or provide links for you to reset your password or update your information. They will simply provide a step by step guide on how to access the Password Station or how to change your password when logged onto campus computers as seen below. This email is from my personal account at MCC stating that my password will soon expire and contains no links whatsoever, in addition to having the correct MCC Help Desk email address. Christopher Wagner is a computer enthusiast and enjoys learning about InfoSec. At age 10 he was given his first computer and that sparked a growing passion in learning how they worked. In addition, he found an interest in the ever-evolving world of InfoSec. What started as simple viruses to annoy people to ransomware demanding payment in return for decrypting data. Learning how to build computers and troubleshoot issues that arose, he was able to start freelancing computer repair. Most recently, Christopher started attending Metropolitan Community College for Information Assurance and hopes to one day find a career in InfoSec.